Oh to be in Cleveland, Brisbane, for the Cleveland Contemporary Music Event (CCME) which features concerts by ELISION and Kupka’s Piano, ensembles foregrounding electric guitar in works that are visceral and haunting. Every now and then in new music the electric guitar is allowed out to play. 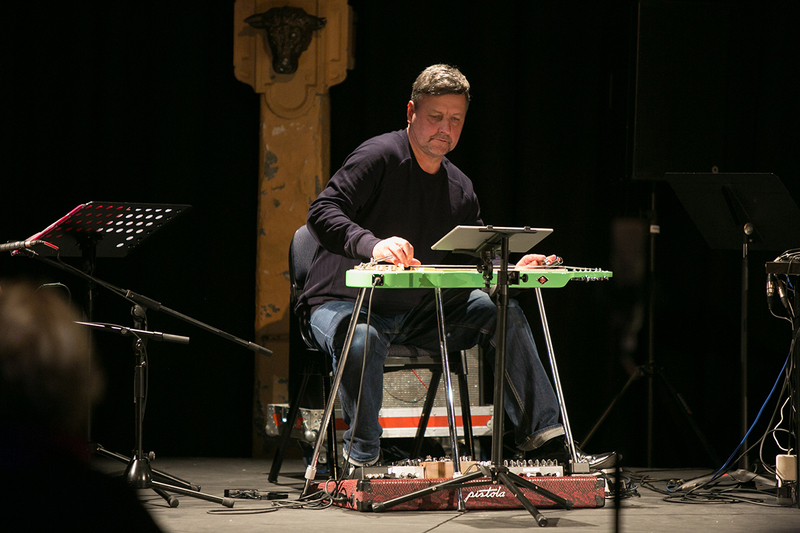 James Hullick in Were/Oblivion, which he performed in the Sydney Symphony Orchestra’s recent Dream Sequence concert, drew on the Hendrix legacy to unleash a powerful instrumental and vocal poem-letter to his daughters. In the 2012 Aurora Festival of Living Music in Sydney’s west, Zane Banks, grippingly focused and passionate, performed George Lentz’s 60-minute Ingwe (available on Naxos CD and on Spotify), part of a body of works with a cosmological drive. In a review, I described the experience as “an epic coursing through the dark night of the soul for solo electric guitar with the doubt, passion and wit of a metaphysical poet cut adrift from his god.” As in the Hullick, the scoring drew on a heritage of popular and jazz electric guitar techniques to powerful effect. And now the electric guitar is to be let loose in two concerts in Brisbane’s Cleveland Contemporary Music Event. ELISION Ensemble Artistic Director Daryl Buckley on lapsteel with electronics will perform solo Aaron Cassidy’s short but exacting The wreck of former boundaries (the title too of the concert), while in a Kupka’s Piano concert, Hauntology, Co-Artistic Director Liam Flenady will play electric guitar with the ensemble in the premiere of his own work, Hauntolgy (also the concert title). Electric guitar takes the lead! Australia’s leading new music ensemble is a force to be reckoned with, as demanding with audiences as it is with itself in concerts that have a visceral intensity. One of my favourite 21st century works is UK composer Richard Barrett’s Dark Matter, a massive cosmological creation written for ELISION and performed and spectacularly staged by the ensemble in Brisbane in 2001 (you can read my description of the experience here). Seek out the work on Spotify, listen to track four and feel the power and the textural subtlety of Buckley’s playing which will also feature in one of two Barrett works in The wreck… concert, world-line (2012/14; 35 minutes), for electric lap-steel guitar, piccolo trumpet/quarter-tone flugelhorn, percussion and electronics. The tuning and setup was devised by Barrett in collaboration with Buckley, to whom world-line is dedicated. After grunting and growling in world-line’s opening like a demented power tool, Buckley’s guitar loops and soars in spectacular slides over a murmuring sea of sounds and impressively engages in a sustained dialogue with Tristram Williams’ eloquent trumpet. Elsewhere it’s one sinuous voice amid others in a sublimely extended, quiet soundscape. Also in the program is Barrett’s codex III (2003; 16 minutes) for trumpets, percussion, violin and electronics and James Gardner’s Torc (2016; 12 minutes) for violin and trombone. Playing alongside Daryl Buckley will be Benjamin Anderson on alto trombone, Graeme Jennings on violin, Peter Neville on percussion and Tristram Williams on trumpets, all superb musicians. The wreck of former boundaries promises to be a very special experience. 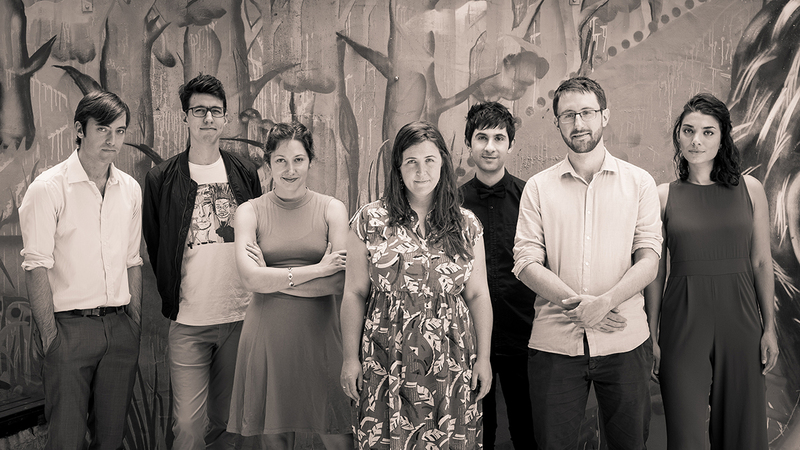 Kupka’s Piano, the Brisbane new music ensemble have garnered praise in RealTime in recent years and today in Matthew Lorenzon’s report from BIFEM2017. They’re presenting a concert in CCME titled Hauntology, featuring works that are variously eerie, weird, bizarre and strangely beautiful, as in American composer John Luther Adam’s mesmeric Red Arc / Blue Veil. I spoke about the concert program by phone with ensemble member, Co-Artistic Director, composer and guitarist Liam Flenady. The title of the concert, Hauntology, is also the name of work that you’ve composed. It’s the first piece I’ve written that’s semi-improvised — sliding between fully-notated sections and guided improvisation sections. It’s for a quintet, a bit of a strange one: two flutes, clarinet, percussion — mostly vibraphone and glockenspiel — and the electric guitar. Where did the idea for the composition come from? Well, it’s a nice title! I’d been reading books by Mark Fisher who wrote about hauntology, a concept he borrowed from Jacques Derrida. It’s about the persistence [as, for example, in the case of ghosts, ideas etc] of traces of absence as in the presence of [a sense of] absence or the absence of presence. That’s what I’m trying to deal with, at least vaguely. How have you realised that play between absence and presence musically? The difference between the electric guitar and the other instruments is dealt with in a way that sharply highlights rather than disguises the difference between them — like putting the guitar in a completely reverb-saturated space while the other instruments are very present, and then switching the guitar to a fully brittle, in-your-face sound while the other instruments are more mellow. These are ways of generating the sense of a trace of something that’s absent or distant from the room, but also actually supremely present. It’s more than a theory inspired notion then? Its about the affect that you get when you have an eerie feeling that something is there but it’s not. Is Hauntology a dialogue between the guitar and the other instruments, between the present and the absent? There are moments of dialogue, like communicating via Ouija board — the idea that you might commune with a spirit that’s not actually there but nonetheless some kind of interaction takes place. I wasn’t suggesting it’s a concerto. Tell me about your guitar playing. LAUGHS No, not a concerto; that would put the pressure on me and my guitar skills. So ideally not. I studied jazz guitar and played a lot of rock music and only in the last year or two have I started playing with Kupka’s Piano even though I’d been composing for them and have been co-Artistic Director for a long time. I’ve recently plucked up the courage to be a new music guitarist. What other works are in the program? We’re playing the Australian premiere of a duo for flute and clarinet by Israeli composer Adam Maor. It’s a beautiful, I guess, Giacinto-Scelsi-inspired dialogue between the two instruments with extended techniques and very subtle microtonal interplay between. We’re playing a short very enjoyable piece by US composer Natacha Diels for piccolo and audio playback. It’s quite bizarre and virtuosic. We’re also playing John Luther Adams’ Red Arc / Blue Veil, something of a departure from Kupka’s normal aesthetic, but we thought it would provide an interesting counterpoint to some of the more European Modernist sounds we normally go for. We’ll also play Adelaide composer Dan Thorpe’s false cognate for flute and electric guitar [hear a version of this other-wordly creation here. Eds] and Olive, a flute duo, composed by Hannah Reardon-Smith, one of our ensemble members. Olive appears on our new album, Braneworlds; it’s a gorgeous, haunting work. Next week RealTime will preview another of the CCME concerts, Lawrence English’s immersive sound work, Viento: Blizzards of Antarctica and Beyond (10 November).